What Are the Different Games at Golden Cherry Casino? What Are the Different Games at Golden Cherry Casino? What Are the Different Games at Golden Cherry Casino? We're known for having some of the best slot machines online, but there are many different games at Golden Cherry Casino. Powered by Rival Software , we offer a full selection of casino favorites to keep every player entertained. Our games are available online or you can download our casino software for richer graphics and more features. Whether you're playing slots, craps, or video poker, there are plenty of bonuses and special promotions available to make your session even more enjoyable. Many people enjoy our video poker games. There are 7 fun variations available, like Double Joker and Tens or Better, where it's easy to get a payout time and time again. We also have Paigow Poker, Red Dog, and multi-hand blackjack if you're looking for a card game that's different than the traditional 5-card draw poker machines. You'll find both American and European roulette, as well as craps and baccarat for a comprehensive selection of casino table games. There's an impressive collection of slots games at Golden Cherry. 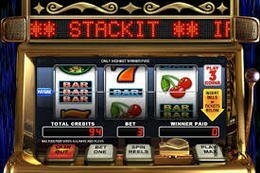 We offer more than 80 of Rival's most popular slots, including iSlots with their amazing bonuses , intriguing video slots, and classic 3-reel slots titles. When you play our video slots, you'll have a chance to win our progressive jackpots. These are often worth several hundred thousands of dollars. As fast as these jackpots grow, winners can sometimes add more than $1 million to their bank account. We also host several slots tournaments throughout the year with generous cash prizes. There are many reasons to choose Golden Cherry as your online casino. If you're a slots fan, that reason is obvious, especially if you're a resident of the US. Our 300% slots bonus with a $3,000 limit is even more enticing. We also offer welcome bonuses with a 50% match that can be used on any of our games, along with weekly promotions , referral bonuses, and other special discounts. A free play mode is available to all registered users. It's perfect for practice or to check out some of the other different games at Golden Cherry, like Cast for Cash, Sudoku, and Bingo.